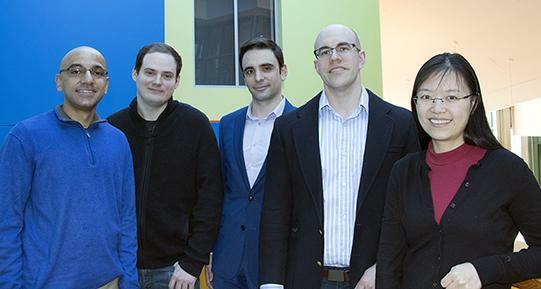 From left to right: Vineet Bansal, David Turner, Matthieu Lefebvre, Ian Cosden and Bei Wang. In today’s competitive research environment, software has become an increasingly critical component of the success of many academic research programs. Princeton’s Research Software Engineering Group is helping to redefine the collaborative possibilities between software engineers and tradition research groups, in order to maximize each project’s success. Our Research Software Engineering group is part of the Research Computing Department, located in the distinctive Lewis Library. Our mission is to help researchers create the most efficient, scalable, and sustainable research codes possible in order to enable new scientific advances. We do this by working as an integral part of traditional academic research groups, providing leadership in the design and construction of complex and highly customized software systems. We can support sophisticated data science and computational research projects in astrophysics, machine learning, neuroscience, and genomics, among many other disciplines. We provide our partner groups with domain-specific algorithms and solution techniques; optimization and performance tuning; and insights and guidance with current and future software development tools, programming languages, and high-performance computing hardware. Our group is committed to creating a collaborative environment in which best software engineering practices are valued, and to sharing and applying cross-disciplinary computational techniques to new and emerging areas. Please contact Group Manager Ian Cosden with any questions.